When I left my husband I was 30. Shannon was 5, Alex was 3 and Samantha was 8 months old. There are far too many bad step-dads out there. I know there’s plenty of good one’s as well but I’m the mom and the risk is too big. I vowed at 30 that I would not get married again until I was 50. I can do a little math. I’m 50 now, Samantha will turn 21 this year. That was my math. No danger of a bad step-dad messing up my children if they’re all over 21. Thirty years old, 3 kids, new to being a single mom, don’t want to get married….but not dead. I felt like I hadn’t had fun in a long time and I wanted to have fun. I love to laugh and I wanted to laugh, a lot! So what does one do when they want to have fun and not get married? Well, personally, I dated a lot of losers. No chance of falling in love there. However, I would NOT recommend that for anyone. Don’t get me wrong, I had a lot of fun. I did succeed in that. I went white water rafting, visited Chicago, took a few weekend get aways to Duluth, went to the Rock House in Wisconsin (don’t recommend that one), visited B&B’s, had dinner at the Windows on Minnesota, went to concerts, bar-hopped, rode in limos, went camping, visited Dallas for the 1st time, went to Twins games, rode on motorcycles….rode on, not drove and oh right, got pulled over by somewhere around 12 squad cars and then watched them take my date away. Retrospectively, I wish they would have kept him longer. I am honest to a point, not to a fault, but to a point. Even then I don’t lie, I just have a way of not quite telling the truth sometimes. Way back when I was still a teen and my middle sister was dating a black guy, she didn’t tell my parents that he was black. My mom came in one day and said “did you know Bernadette is dating a black guy?” I did know, she had told me but I looked at my mom and said “well mom, I’ve never met him and never asked her what color he is”. Neither statement was a lie and I didn’t answer the question but she was pacified. Right, see how I can do that? However, in that particular story Bernadette blew it for me. Bern came in and my mom asked Bern if Billy was black and Bernadette looked at me and said “Jacque told you, didn’t she?” So it doesn’t always work but hey, ya gotta try. Both of my parent’s had pretty prejudiced parents. To my parents credit they have learned that people are people, they’re either good or bad, not black or white. I adore my parents :o) Anyway, back to me being kind of honest. Apparently men who’ve hit 30 and haven’t been married want to get married. Right from the beginning I’d let them, my dates, the losers know, okay we can hang out and have fun if you want to but I’m never going to marry you. I know, wrong again but hindsight is best. Apparently men take that as a challenge. No, no…not a challenge, I was being brutally honest. I said it often, loud and long. At one point I had a friend of mine, Mark, 10 years younger than me, ask me if I’d be his something…the phrase isn’t coming to mind right now (com’on, it’s been 10 years), bottom line, he wanted to make sure he got married by the time he was 40 and the year he turned 40 I’d turn 50. Would I marry him if he wasn’t married and I wasn’t marrying someone else? He’s so cute, how do you turn something like that down when you know it’s never going to happen? I told him yes. Would that be his “back up’? Is that the phrase I’m looking for? Since then Mark has been married and divorced and I adore him. Wouldn’t say yes to anyone, ya know. To my credit, I didn’t ever “use” anyone. I always paid for myself , or you pay this time and I’ll pay next time. I never wanted to feel like I owed anyone anything. That and I always had cab money. I was very careful about who I dated, they had to have people I know that would vouch for them. I once accepted a date from a complete stranger, once. Right, and I am pretty sure I was drunk at the time, but I said yes and gave him my phone #. At the last minute he had changed everything we had planned to do and every place we were going to go. Even on that one I thought I was being careful. I had agreed but it would be somewhere local and we would meet there. The day of the date he called and said he’d pick me up instead of meeting me and we were going to go here and there (not local and unfamiliar) instead of here and there (local and familiar). That was when I was still pretty polite, I agreed, thought about it for 2 minutes and then called him back and told him no. Seriously? I didn’t know this guy from Adam, wasn’t about to take the chance that suddenly Rob would be the only parent. My kids would have been screwed if anything had happened to me. I didn’t go and for the next 3 months he sent me flowers and I got several phone calls of him whining. Really? You want to win a girl over? Whining won’t getcha there, buddy! Ran into him kereoke night at a local bar (wait people will generally meet at a local bar after work, and that’s what I did then) and he got up on stage and dedicated the song “Suspicious Minds” to me. Fine, I can take that. Again, retrospectively, he was hard enough to shake off even though I didn’t date him. Imagine how hard he’d have been to shake off if I had. That’s the whole problem w/dating losers. At some point they expect rights like other people, I didn’t even date this guy! Looking at the title of this blog (does anyone else hate the word “blog”? ) I didn’t cover what my intention was in the title so I guess I’ll save that for another night. Bottom line, Rob just didn’t count. He is my children’s other parent, not a step-dad. So anyway I broke the rule of not marrying again until I was 50 when I married Rob again. Again I repeat myself, that is another story and I love him. Okay, that and I gotta go sing to Boo now. Boo is Samantha’s cat, he’s 8 years old and no one adores him like Samantha. Boo likes to imagine himself as a great hunter-warrior dude. We let him think that. We have 2 cats that live here and neither one of them belong to us. Lacey is Shannon’s cat who Shan took with her when she moved out and, well, Lacey let Shannon know, very loudly and for 2 weeks straight that she wanted to go to her real home. Again, another story. Bottom line, Lacey came back to live w/Bruno, Boo, stairs, Samantha, Alex, Rob and I. Lacey is white and if she were human, she’d be blond. Boo belongs, as I said to Samantha. He’s all black w/green eyes and was about 6 weeks old when Samantha got him shortly before her Halloween birthday in 2002. He was a year old when Lacey came on board. Apparently, he hates babies. If Boo where human he’d be a cross between Einstein and Hitler. Very bright but would like to exterminate all the rest of his species. He has complete command of the English language, excepting of course, the speaking part, for which I am grateful. Black and white, I call them Ink and Page. If there were a cat god, it would be Bruno. Bruno left us in 2006. He is still missed. Back to Boo. As rough and tough as he tries to be, and it’s all for his image he’s got in his mind about himself, he still has the teeny-tiny, baby, squeaky, kitten voice when he meows. It’s tough to look at him when he speaks and take him seriously. Never the less, we do that when what he has to say is important. When Samantha went away to UMD in 2008 I purchased around $200 worth of toys to try to pacify him. Right, well that didn’t work because he doesn’t want to play…he wants to be entertained. Apparently play is work for him and he’s too cool to be seen having a good time. He turns his nose up at Lacey when she’s playing. He’s just much too cool for that. I can tell you though that we have spotted him, from time to time, playing. Once he notices we’re watching he immediately stops. I can also tell you that we have certain toy mice that only Boo plays with that I keep finding everywhere. You got it, he only plays when there are no witnesses. Boo adores the great outdoors. His favorite thing is to go outside. Our deck stretches the length of the house and our backyard is a pond. Oh yeah, there are critters. Boo feels the need to jump off the deck to chase the critters. He is after all, the big hunter-warrior dude. Boo can also climb back up the deck (Alex can too…and apparently Rob can’t. Right, another story) and pretend he’s innocent and he’s been there all the time. Samantha left for school in August that year and had such a busy schedule that she wasn’t expected home until Thanksgiving. Boo was a sad, a VERY sad boy. At the time I was doing research on the band The Seekers from the 60’s. I can’t tell you why that was my interest at the time but it was. They have a song entitled “I’ll Never Find Another You”. Don’t you love it when something hits you in the face? I downloaded it, changed the word “you” to “Boo” and started playing it repeatedly and singing at the top of my lungs for Boo. Guess what? Music does sooth the savage beast, as Boo imagines himself to be. He completely locked himself in. So then I would pick him up and dance with him, as well as sing to him. Tough, hunter-warrior as he is, he loved it. Anytime after that when he was missing Samantha I’d turn the song on loudly and sing, sometimes dance with Boo (again, only if there are not witnesses and that includes Lacey) to The Seekers. He never wants an audience to something that may be considered unmanly. Samantha had to pick me up from work once this summer and brought Boo with her. Boo hates riding in the car and tends to “sing” if he must endure it. Okay, his “singing” is more like howling, or knowing Boo, probably swearing. She had classical music on trying to sooth him. I got in and popped in The Seekers and SR and I started singing loudly and Boo shut up, checked out the car, looked out the windows, climbed up on the back dash. He was fine as long as we replayed “his” song. Incidentally, Samantha did have to come home unexpectedly for a funeral after she’d been gone about a month that 1st time she left and she scooped up Boo and he was in his heaven. It took about 3 minutes for him to come to the realization of “Wait a minute! You left me!” and then he slapped her for leaving him. He repeated that response the 1st 3 times she came home. “My mom’s home! Oh, I love you, I missed you, I love you, I’m SO glad you’re here…wait a minute, SLAP”. He just doesn’t cotton to being dissed. The only other reason for Boo slapping anyone is if they blow raspberries at him. That’s a guaranteed slap in the face from Boo. He get’s dissing. Boo has known for days that SR was leaving again. He understands packing. We had a going away party for her on Saturday and he sulked most of the day. Normally he’s a party animal, he loves attention and can be the highlight of anything when we have people over. He sulked most of Saturday. Today he knew that this was THE day. He sulked all day. Get that. We came from the airport tonight after taking SR there and I sat down. Boo sat down right next to me. Rob went to the deck to smoke and held the door open. Boo was too sad to go out. Nothing I said made any impression . He just wanted to sit by me. I knew he was sad but that’s his passion, the deck. I got up and joined Rob outside (I’m not his mom but I am 2nd best) and we still had to coax him to get him on the deck. Once we came in I stoned both cats with catnip and it’s been a while since then so I imagine it’s time to play his song and sing to Boo, the mighty, hunter-warrior dude, again. It’s very true that opposites attract. My friend Leon and I are as different as night and day. He is the salt of the earth, one of the nicest people I’ve ever met in my life. I can be salty. He is polite to everyone he encounters, I can be completely rude. He has a giant heart, I pick and choose. If ever, he’s very seldom a lounge lizard, I can excel at that. He was born during the depression and I’m the last of the baby boomers. In my early 30’s, he and his friend, Roger Carlson, used to come into the restaurant I worked at every Saturday night. Roger had the out going personality, Leon was the shy one. One night I informed them both that I was tired of the fact that they were each other’s date EVERY Saturday night and that they needed to get out there and live a little. I pointed to a table w/2 women sitting at it and told them that I was going to go over and line up dates for them. I walked over to the table w/the women at it and started talking to them, it wasn’t my table, I just struck up a random conversation. Their table was far enough away from Leon and Roger’s table that those 2 couldn’t hear what we were conversing about, they just got to witness me talking to them. Then I turned around and pointed to a picture on the wall behind the guy’s table and said to the women “don’t you love that?”. At that point I got to take a glance at Roger and Leon, Roger was laughing, poor Leon was beat red. The women looked in the same direction enthusiastically nodded that they did like that picture. To most people it would have appeared that the ladies scoped out the men. I ended my conversation w/the ladies and walked back to Leon and Roger and told them that they were all set for the following Saturday. There’s the difference between my dad and I, he would have asked the ladies to go out with the guys and I just pretended to :o) Anyway, I thought poor Leon was going to die right there, so I confessed. Another Saturday night, about a year later Leon came in, as usual, on Saturday but he was by himself and didn’t sit down. I walked over to him and asked him what was up, he let me know that his dear friend Roger had had a brain aneurysm and was no longer with us. 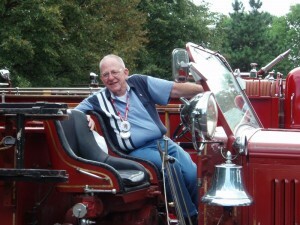 Roger Carlson was 56 years old and is the one who started the annual Fire Muster in Burnsville. He owned somewhere around 12 firetrucks when he died. He’s also the one who introduced me to my dear friend, Leon. When I attended his funeral I shouldn’t have been surprised to run into a fellow waitress that I had worked w/15 years previously. Roger made an impression on people and always got to know those who provided him with some service or another. I’m sure that if I’d have asked others, at Roger’s funeral, I would have met his grocer, his butcher, his baker and so on. Not everyone would have done what Leon did when he made it a point to let the wait staff of the Timberlodge know of his friend’s passing. Bless him for that. Three of us from the Timberlodge attended the funeral. Leon assured us he would keep coming in for dinner, to keep in touch, and he did. Not every Saturday, but at least once a month he would come in by himself just to see us. My older daughter, Shannon, started working there as a hostess when she got her 1st job. He got to know her, came to her grad party. I took all the kids up to New Hope and he took them for a ride in his firetruck back in 2003. We send each other postcards from our adventures, I was slow to get email but when I did we started emailing and when I finally left the restaurant industry in 2004 we decided that we’d go out to lunch occasionally instead of me serving him dinner. Since then we’ve gotten to know each other a lot better. Shannon, Kevin and Samantha have each joined us from time to time. He came to Samantha’s grad party and Shannon and Kevin’s wedding. Leon takes an annual summer trip and goes everywhere. It used to be by motorcycle. He took his last summer motorcycle trip when he was 75 years old. He sold his beloved motorcycle a few years later. He was very sad but said that he’d never had an accident and wanted to keep it that way. I was sad for him. But he still goes every summer, just by car now. To see cousins, aunts, uncles, his daughter and her children on the east coast, to steam engine museums, firetruck shows, you name it. He’s back from his trip this year and I can’t wait to have lunch with him to hear all about this year’s trip. Leon doesn’t drink, he has never smoked and he’s a nice man. I like beer, I still smoke and I pick and choose when I’m going to be nice. Like I said, opposites attract. He has 3 children, I do too. So there ya go, we have something in common after all.